Two men walked in to my range last week with allah akbar ring tone and message alert tones on their smart phones. They spoke very little english, one did not have proof of U.S. citizenship, yet they wanted to rent and shoot guns. They were constantly glancing toward the cameras in the range, then looking at each other and speaking in their own language. Their behavior was so strange, it frightened my patrons. No one would enter the range to shoot while they were there. Some of my customers left. I lost business and the people who remained at my facility said they did so out of fear for my safety. Federal policies require that non-permanent residents have a valid hunting license to rent a firearm, but the internet also includes several threads suggesting that this federal law is neither well-known nor well-enforced. A poster at AR-15.com, a pro-gun forum board, expresses surprise at discovering the law’s existence, while other responders express their disapproval of the law and how it infringes upon gun-carrying freedoms. Since I have no way of discerning which muslims will or will not kill in the name of their religion and the commands in their koran, I choose to err on the side of caution for the safety of my patrons, just as I would anyone else who aligns himself with an organization that commands him to commit crimes against innocent people. It goes without saying that Morgan’s perspectives on Islam are flawed. Never mind her rather bizarre distinction with regard to “religion” versus “theocracy” — Morgan seems to forget that constitutional protection of the freedom of religion also protects the freedom of speech and to peaceably assemble, meaning that even if you buy her flawed argument that Islam is not a religion, it would still be a protected adherence according to the Bill of Rights — several Muslim clerics have been busying themselves for the last decade clarifying the contents of the Qur’an. Specifically they have discussed how there are no apostasy laws listed in the text of the Qur’an, and that the text in fact prioritizes “freedom of conscience” or religious choice. But, these details are, of course, lost onJan Morgan, religious scholar. 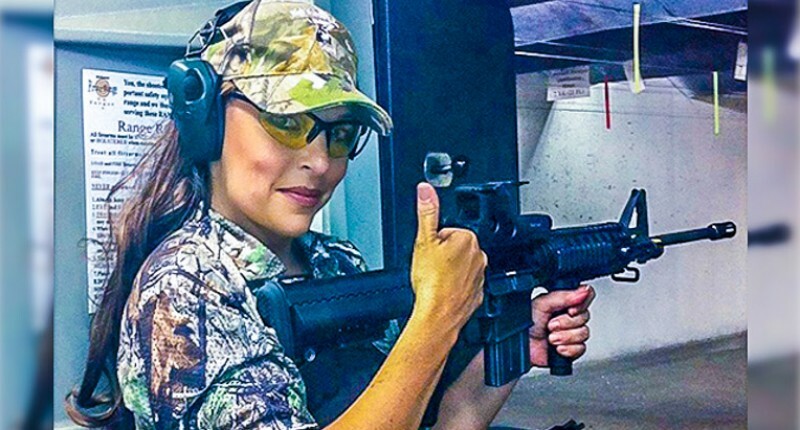 Morgan received a little flack last year for this post among the (more liberal) of those within the gun community (Morgan describes her critics as “politically correct mental midgets“). However, she has once more resurfaced this week with a story that she recently denied service to two customers: a South Asian American father-and-son duo. 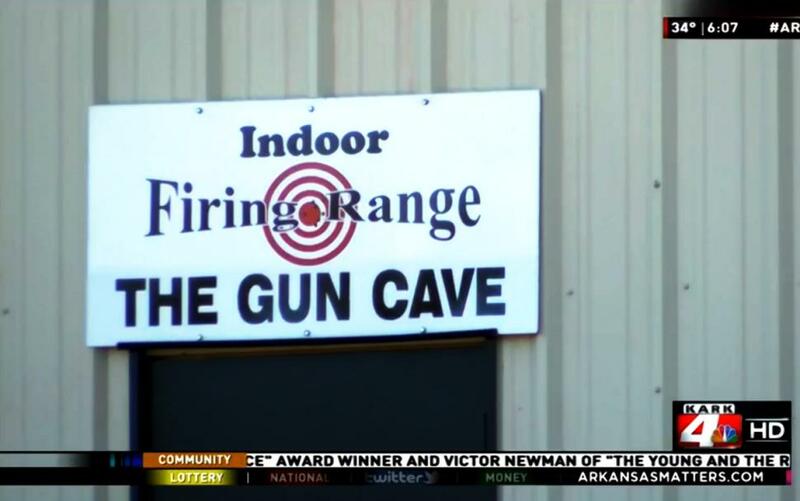 The Arkansas Times reports that the person behind the counter, presumably Jan Morgan, demanded to know if the two would-be customers were Muslim — neither are — when they attempted to rent a firearm. After saying they weren’t and further asking for an explanation on the store’s policy, the two were thrown out of the store. Not wanting to cause a scene, they left. “We’re brown; I don’t know if she assumed we were Muslim,” he continued. “When she first asked us, she said, ‘I would hope if you were Muslim you guys wouldn’t be cowards and would be up front about it. '” The student told the Times he was born in the U.S. and lived in Hot Springs for ten years before going to college in a different Arkansas town; he considers Hot Springs his home. Neither he nor his father plan to take legal action over the incident; they say they don’t want to stir up trouble. But the student said he felt he had to speak up and let people know about what happened. “It’s definitely crazy that there’s such intolerance,” he said. This incident suggests that Morgan’s discriminatory anti-Muslim policy is being practiced alongside an unspoken, parallel policy of racial profiling that specifically targets non-White customers for extra scrutiny. There is no evidence that Morgan asks new customers who are White whether or not they are Muslim. Many local, state and federal laws prohibit discrimination based on race and/or religion, including by business owners or managers against prospective patrons. Cracker Barrel, for example, famously faced a federal civil rights lawsuit for their informal practices discriminating against Black customers; that case was ultimately settled for millions of dollars. The Arkansas Civil Rights Act of 1993 establishes the civil right of all Arkansas residents “to be free from discrimination because of race, religion, national origin, gender, or the presence of any sensory, mental, or physical disability”, which includes “the right to the full enjoyment of any of the accommodations, advantages, facilities, or privileges of any place of public resort, accommodation, assemblage, or amusement; the right to engage in property transactions without discrimination; [and] the right to engage in credit and other contractual transactions without discrimination”. America’s growing Islamophobia and anti-Muslim hate has led to increasing violence against both Muslim and non-Muslim people, both of which include many members of the Asian American community. Not only have anti-Muslim hate crimes been steadily increasing at a sharp rate since 2001, but, numerous Sikh Americans have been victims of violence sparked by mistaken identity as Muslims. Meanwhile, Jan Morgan continues to defend her “Muslim-free” store policy. 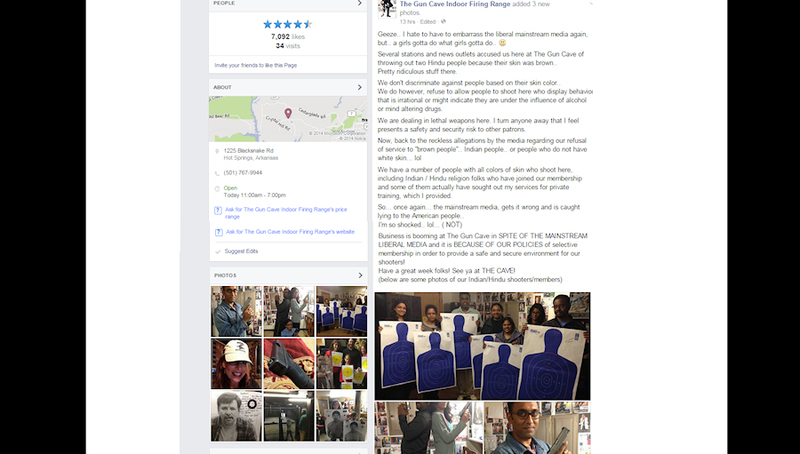 On her Facebook page, Morgan added three photos that purport to demonstrate that she doesn’t discriminate against all Brown people; she uploaded three pictures depicting a party of “Indian/Hindu shooter/members” as token evidence of her racial tolerance. Morgan forgets that no one is accusing her of Jim Crow-style segregation. Instead, Morgan appears guilty of implementing a policy that preferentially subjects some patrons — including Asian American customers — to excess scrutiny and denial of service based solely on their skin colour and/or perceived religious affiliation. As for the father-and-son duo? Morgan implies that they were denied services because they were “irrational”, or “under the influence of alcohol or mind altering drugs” — a decision she arrived at after they questioned her “Muslim-free” policy — and therefore, Morgan argues they posed a dangerous threat to her other customers. Sound believable? Yeah, I didn’t think so either. The Arkansas Times tried to reach Jan Morgan for further comment and was rudely hung up on.